Who qualifies for an American University / College Soccer Scholarship? The past two decades has seen an emergence of new and exciting soccer talent, both men and women, from the USA. The UK Premier League has seen an influx of US Internationals playing regularly for teams, who thirty years ago, would almost certainly not have considered sending their scouts to the USA looking for potential first team players as a priority! The fact that the USA has repeatedly qualified for both men’s and women’s World Cup competitions and acquitted itself well is due in no small measure to the US College system. This is due in part to Men’s Soccer Scholarships or Women’s Soccer Scholarships and Men’s Football Scholarships or Women’s Football Scholarships. US Colleges always have and always will be the providers of the next generation of US sporting stars. Players such as Brad Friedel (Spurs), Ryan Nelson (Blackburn Rovers), Brian McBride (Fulham), Clint Dempsey (Fulham), Bobby Convey (Reading), Claudio Reyna (Sunderland), Tim Howard (Man Utd & Everton), Jay De Merit (Watford) and Kasey Keller (Spurs), have all enjoyed fine careers in the UK, despite the fact that they did not leave college until they were 23 years of age. For years in the UK, soccer clubs have considered that if a young player reaches 19 years of age and has not broken into the first X1, he has little or no chance of becoming a professional soccer player. The emergence of ‘new’ US soccer talent has to some extent exploded this myth. It must be noted that all the above named players went to US College at 18/19 years of age, completed their respective degree courses and then decided to pursue a future in professional soccer. This puts them in the enviable position of having a degree to fall back on when their professional playing days are over. Few English born professionals can boast the same academic background. To a large extent, this is the reason why so many young UK based male and female soccer players are now looking to continue both their academic and soccer development programmes in the USA. It is a fact that US Colleges boast some of the finest sporting facilities to be found anywhere in the world. They also possess some very innovative soccer coaches who ensure that their soccer programmes are always ‘student centred’. US Colleges unlike some of their UK counterparts do not permit conflict between some academic and sport programmes, and students are at ALL times actively encouraged to maximise their sporting potential whilst maintaining a high standard in their degree studies. Only the best young academic/soccer players will be considered for a US Men’s Soccer Scholarships / Women’s Soccer Scholarships or Men’s Football Scholarships / Women’s Football Scholarships. If you have a strong soccer playing background and have possibly trained at a professional soccer club in the UK or have played at local county level, then you could well be looking at gaining a substantial US College scholarship offer. 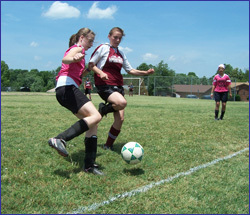 US College soccer coaches will often request references and DVD evidence of your game. Sporting Chance USA can help you provide this evidence. So if you feel you have the above criteria, then we would like to hear from you. In return we can guarantee that we will be contacting numerous selected US College soccer coaches on your behalf. Sporting Chance USA has an excellent working relationship with numerous US soccer coaches and we are constantly being asked to recruit exciting new UK talent. How much can you expect to receive if you are successful in gaining a US Soccer Scholarship? An annual US University /College programme will normally cost between $20,000 – $35,000 before a scholarship award. If you are successful in obtaining a scholarship award, this can reduce the cost to between $6000 – $10,000. It must be noted that an American University / College soccer scholarship will normally include the cost of tuition fees, on-campus insurance, accommodation and food. This figure compares favourably to the cost of attending a UK university, as it has been announced that most UK students attending a UK university can expect the cost to be £15,000 plus when accommodation and food is taken into consideration. Unfortunately student loans are not available to UK students who decide to study abroad. Also US College grants are few and far between and should not be relied upon.